This easy batter mixes up in one bowl. Makes 2 loaves. You'll need two 9x5 loaf pans. Enjoy plain or add in some raisins, dried cranberries, nuts and/or chocolate chips. Grease two 9x5-inch loaf pans and set aside. In a large bowl, whisk together the flour, baking powder, baking soda, salt, cinnamon, nutmeg and cloves. Add the white and brown sugar and and mix well to combine. Add the oil and pumpkin and stir until well combined. Add eggs one at a time, blending/whisking thoroughly after each addition, until batter is smooth. Stir in any add-ins you are using (raisins, dried cranberries, nuts or chocolate chips - up to 2 cups total). Pour into your two prepared loaf pans, dividing it evenly between the two pans. Bake at 350F for 50-60 minutes, or until tester inserted in the middle comes out clean. Let cool in pans for 5 minutes, then remove from pans and cool completely on a cooling rack. Tweak the spicing to your tastes! I am not a huge fan of cloves, so I just add a pinch. If you are clove lover, add up to 1 tsp. I sometimes only add 1/2 tsp nutmeg, depending on how spicy I'm wanting the bread. 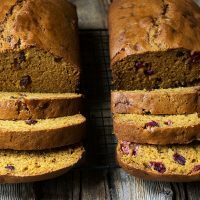 If you are spicy pumpkin bread lover, add a heaping tsp of each of the 3 spices.